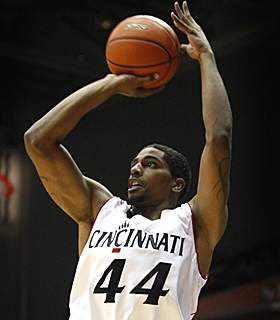 The Bearcats were powered by Deonta Vaughn's 20 points, and an unlikely source to beat South Florida Wednesday night. With Lance Stephenson on the shelf due to an ankle injury he suffered in practice Tuesday, Jaquon Parker entered the starting line up and put in 15 points to go with 4 rebounds and 5 assists. Rashad Bishop had a nice game as well with 15 points. UC improved to 13-6, 4-3, and South Florida fell to 11-7, 1-5. The Bulls were powered by Dominique Jones who scored 21. But, it took him 19 shots to get there. He did have 6 boards and 4 assists. USF also got good performances by Chris Howard (16-10) and Jarrid Famous (14-7-2 blocks). The Bearcats had a great offensive game shooting 56% from the field. They shot 36% from 3, but a woeful 13-23 at the free throw line. USF shot 44%, 17% deep, and 13-17 at the stripe. Let's take a look at how the Bearcats got the win. As soon as the ESPN2 coverage kicked off, we found out Lance wasn't playing and that the starting line up was Bishop, Yancy Gates, Vaughn, Parker and Steve Toyloy. Parker got right into the grove by making the Bearcats first shot, a 3. Yancy Gates powered a 10-4 Cats start with 6 points, but picked up 2 silly fouls and sat on the bench from the 15 minute mark on. South Florida would use that momentum to go on 10-3 run capped by a Dominique Jones lay up for the lead. Jones had 6 of the first USF 14. The teams traded makes before UC went on a run that featured a put back by Ibrahima Thomas, his only 2, an alley oop lay up from Vaughn to my best friend Dion Dixon, and a Vaughn lay up and 2 free throws to take a 23-16 lead halfway through the half. That was a really long sentence. USF wouldn't lay down here either storming back into the lead 24-23 thanks to 4 of Mike Mercer's 10. UC, believe it or not, settled into taking 3s at this juncture with Parker, Dixon, and Darnell Wilks, who played awful, missing. Rashad Bishop would break a 26-26 tie with a 3 and UC would hold the lead the rest of the game. Spoiler alert. UC was able to pop the lead to 8 on a Parker lay up, Bishop lay up and a Vaughn 3. Jarrid Famous had 8 points in the half, and broke up that Cats run with a lay up of his own. Steve Toyloy would get those points back on a dunk off a batted around offensive rebound. The half ended with Deonta Vaughn wisely getting fouled while attempting a 3 and netting all 3 freebies for a 41-32 UC lead at the half. Both teams shot 50%, USF 13-26 UC 15-30. USF was 0-6 from 3 and 6-7 at the stripe, while UC was 4-11 and 7-9. Scoring wise, Jones had 10, Famous 8 and Mercer 6 for the Bulls. For the Bearcats, Vaughn had 13, Bishop and Gates 6, and Parker and Toyloy 5. UC turned the ball over just twice that half. The difference was the 3 point shooting, gasp!, and the Bearcats ability to offensive rebound. The foes swapped buckets to start the second half. Yancy Gates wasn't a fan of the action, so he picked up his 3rd foul with 17:30 left. Steve Toyloy would have a dunk where he went from one side of the basket to the other, and the Cats lead by 10 at the first media break. The Bulls would continue to chip away and fall back behind. A 3 on 1 break for a Jones dunk to make the score 49-43 was met with a Deonta Vaughn 3 on the other end to push the lead to 9. Yancy Gates would re-enter the game at the 14 minute mark, and still not be impressed and get his 4th foul and head back to the bench with 13:51 left. The Bulls cut the lead back to 5 when Chris Howard hit the first USF 3 with the shot clock running down. Jaquon Parker would not stand for it, and go on a 6-0 by himself. Parker hit a jumper, free throws and a lay up to give the Cats a 58-47 lead. Biggie McClain would extend the lead to 12 by taking, and making, his first free throw of the season. He ruined the perfection by missing the second. With 8 minutes left, the Bulls would make their last run. Dominique Jones hit his only 3, Bishop would make a UC jumper, and Jones would score a lay up. Cashmere Wright played 4 minutes and the only stat on the box score was a turnover as he threw a pass Anthony Crater picked off and took for a lay up with 5:49 to go. Mick Cronin would call time out, but the next trip down the court Rashad Bishop threw a pass right to Crater, and Crater took the ball to the rim for the last of his 4 points and made the score 61-56. The next sequence would seal the game. Dion Dixon banked in a j from the free throw line that was as ugly as it sounds. Rashad Bishop would score a lay up on a nice inbounds play to make the lead 7. The star of the night Jaquon Parker took his man down on the box and nailed a turnaround jumper for his final points and made the UC lead 9. The last major gasp for USF was airballed by Crater with 3:24 left. Vaughn made a lay up to get the lead to 11. Chris Howard came back with his last 3 to cut the lead to 8, but USF's press was broken, ending in a lay up by Gates. The last 2 minutes were spent with USF trying to score, and UC at the line, where they weren't very good. Rashad Bishop went 1 of 2, but got a dunk off the rebound of his miss. Yancy Gates would miss both. Larry Davis missed his first 2 free throws of the year. South Florida didn't score, so it didn't really matter much. But you would like to see the men iron it out from the line. All in all, this is a good win for the Bearcats. Like I mentioned earlier, this wasn't so much a must win as a can't lose. If the Cats lost this one, along with losing to Seton Hall and St John's, they would have been in trouble in the Big East. Instead, they are a game over .500 and can get back to 2 games over as they travel down I-71 to face the Louisville Cardinals Sunday afternoon. One last time, I want to mention Jaquon Parker. He was that good tonight. If he can step into the point guard role that UC needs, it could be the break the Cats need to get the offense going. Steve Toyloy and Rashad Bishop played very well too. Toyloy had 9-8 in a game Gates spent much time on the bench. The rebounding needs to shape up, because Louisville hits the glass hard, especially on the offensive end. Let's enjoy this one until Sunday.